To see if William C. Pevec is accepting new patients, or for assistance finding a UC Davis doctor, please call 800-2-UCDAVIS (800-282-3284). 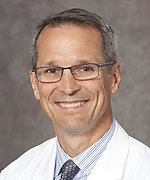 William C. Pevec specializes in complex vascular surgery, including aortic reconstructions, mesenteric and renal artery reconstruction, and reconstructions of the arteries of the distal leg and foot. His practice includes both minimally invasive endovascular procedures and open reconstructions. His clinical research centers on reducing preoperative risks for and outcome assessment of patients undergoing vascular operations. Pevec WC. Combined Iliac Stenting and Femoral-Femoral Artery Bypass. Chapter 48. In Master Techniques in Surgery: Vascular Surgery, Lippincott Williams & Wilkins, Philadelphia, PA, 2016. Hedayati N, Brunson A, Li CS, Baker AC, Pevec WC, White RH, Romano PS. Do Women Have Worse Amputation-Free Survival Than Men Following Endovascular Procedures for Peripheral Arterial Disease? An Evaluation of the California State-Wide Database. Vasc Endovascular Surg. pii: 1538574415608269. PMID: 26462976, 2015. Armstrong EJ, Wu J, Singh GD, Dawson DL, Pevec WC, Amsterdam EA, Laird JR. Smoking cessation is associated with decreased mortality and improved amputation-free survival among patients with symptomatic peripheral artery disease. J Vasc Surg. 2014;60(6):1565-71. Javed U, Balwanz CR, Armstrong EJ, Yeo KK, Singh GD, Singh S, Anderson D, Westin GG, Pevec WC, Laird JR. Mid-term outcomes following endovascular re-intervention for iliac artery in-stent restenosis. Catheter Cardiovasc Interv. 2013 Dec 1;82(7):1176-84. Armstrong EJ, Singh S, Yeo KK, Saeed H, Anderson D, Westin GG, Dawson DL, Pevec WC, Laird JR. Nitinol Self-Expanding Stents for Very Long Femoropopliteal Lesions: One and Two Year Outcomes. J Endovasc Ther. 2014;21(1):34-43. Armstrong EJ, Dawson DL, Laird J, Pevec WC, Singh GD, Singh S, Westin G, Yeo KK. Endovascular Recanalization of Infrapopliteal Occlusions in Patients With Critical Limb Ischemia. J Vasc Surg. 2014;59:1300-7. Armstrong EJ, Balwanz CR, Dawson DL, Javed U, Laird JR, Pevec WC, Saeed H, Westin GG. Endovascular Therapy is Effective Treatment for Focal Stenoses in Failing Infrapopliteal Vein Grafts. Ann Vasc Surg. 2014;pii: S0890-5096(14)00462-2. Armstrong E, Humphries MD, Laird J, Pevec WC, Welch P. Outcomes of Covered vs. Bare Metal Balloon Expandable Stents for Aortoiliac Occlusive Disease. J Vasc Surg. 2014;60(2): 337-43. Hylton J, Li, CS, Pevec WC, Smith C. Octogenarians develop infrapopliteal arterial occlusive disease in the absence of traditional risk factors. Ann Vasc Surg. 2014;28(7):1712-8. Pevec, W.C., Lee Pu, Levine, Wei et al. Revascularization of the Ischemic Lower Extremity. chapter 67, pp. 1117-1140. In Lee L.Q. Pu, Jamie P. Levine and Fu-Chan Wei (Eds. ), Reconstructive Surgery of the Lower Extremity, Quality Medical Publishing, St. Louis, Missouri, 2013.